A fleece jacket for keeping your dog warm! 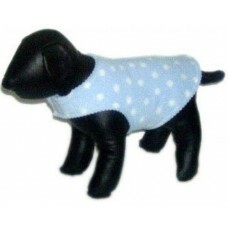 PetHangout is feeling warm over our Blue Dot Doozie Jacket from our Cool Dog Jackets collection. This jacket has a double layer of fleece for amazing warmth for your dog. It is also reversible and washable. And the fashion sense is perfect with white polka dots. PetHangout has other coats for your dog like our All Weather Windbreaker and Camo Jacket.